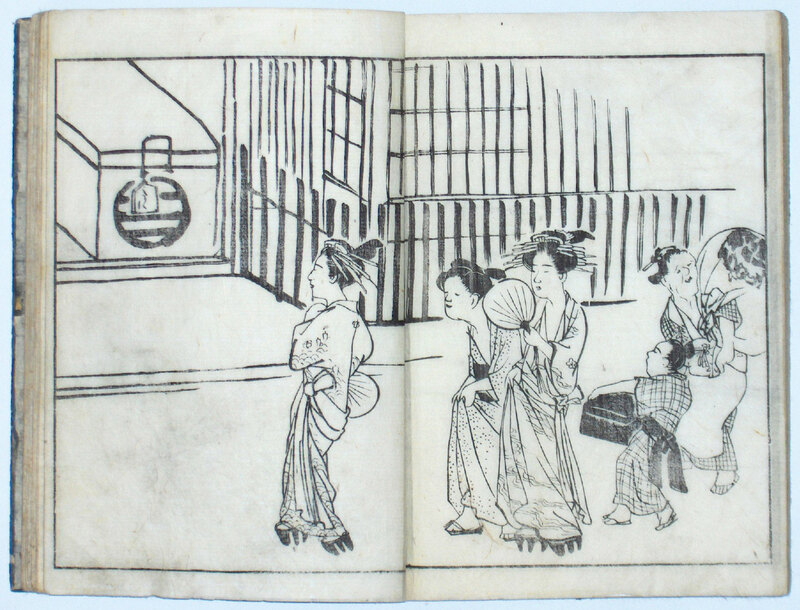 A fine pair of paintings: One showing women of Ohara; a mountain village north of Kyoto. 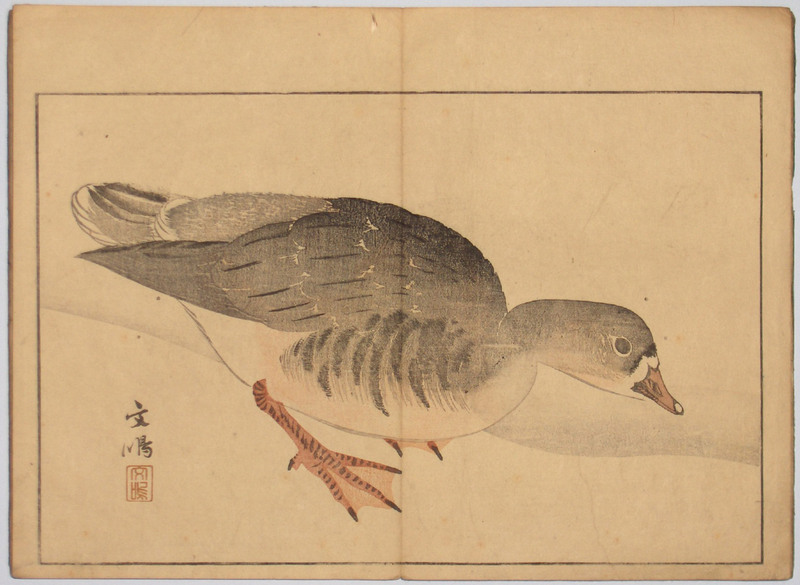 These Oharame collected brushwood and firewood in the fall to sell in Kyoto. 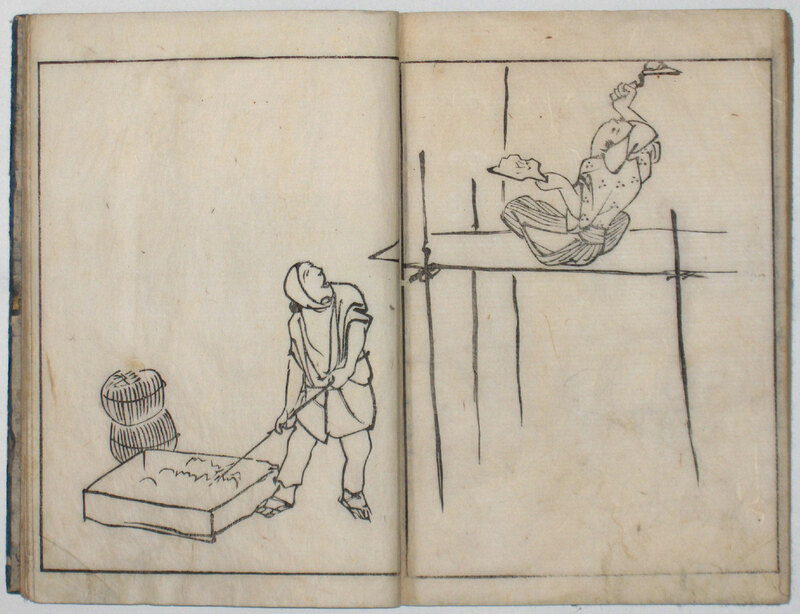 They are often depicted and obviously caused a stir when they entered Kyoto to ply their trade. Evidently the custom has been going on since the 12th century. 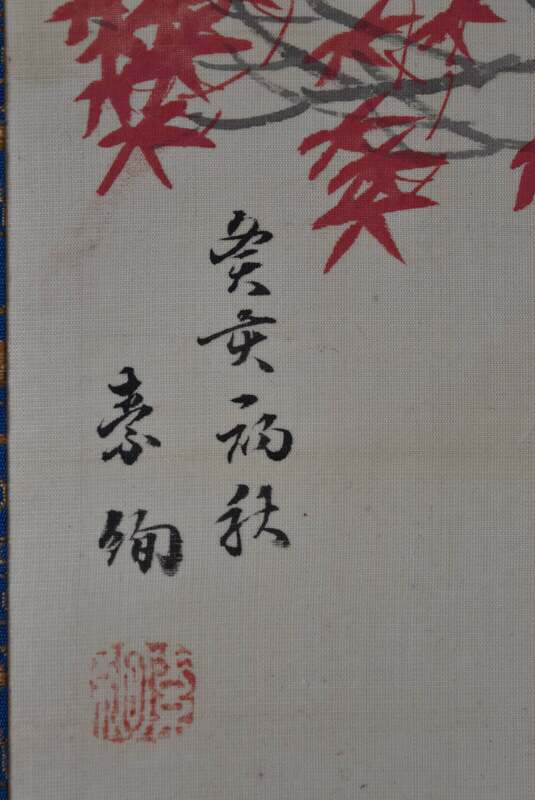 The other painting shows spring tea-leaf picking at Uji. An area located at the southern edge of Kyoto prefecture. Shincha, the new tea of the year, was prized and collected at the beginning of May. 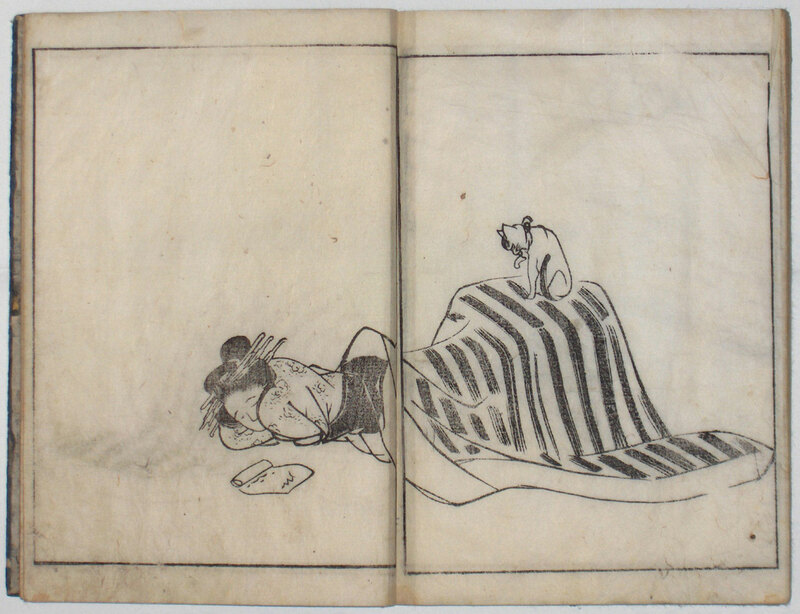 Soken was one of Okyo’s ten best pupils, lived in Kyoto, and is known for his fine illustrated books, such as: Yamato jimbutsu gafu, 1800; Yamato jimbutsu gafu kohen, 1804; Soken sansui gafu 1818 and others. 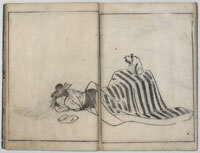 Sumi and full colour on paper, each 39 x 13.5 in; 99 x 34.3 cms. Fine, fresh condition and newly mounted. 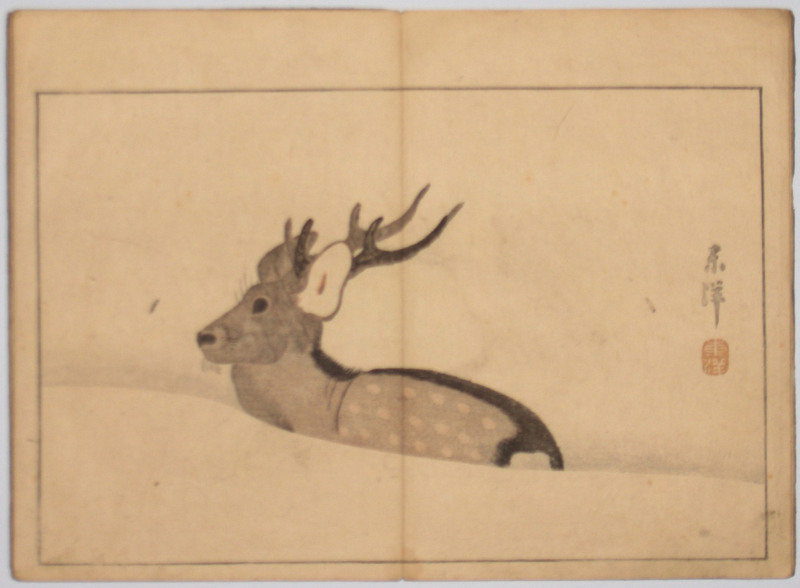 Each signed Mizunoto i Soken, Soken painted in the Boar Year, 1803 with seal Soken. 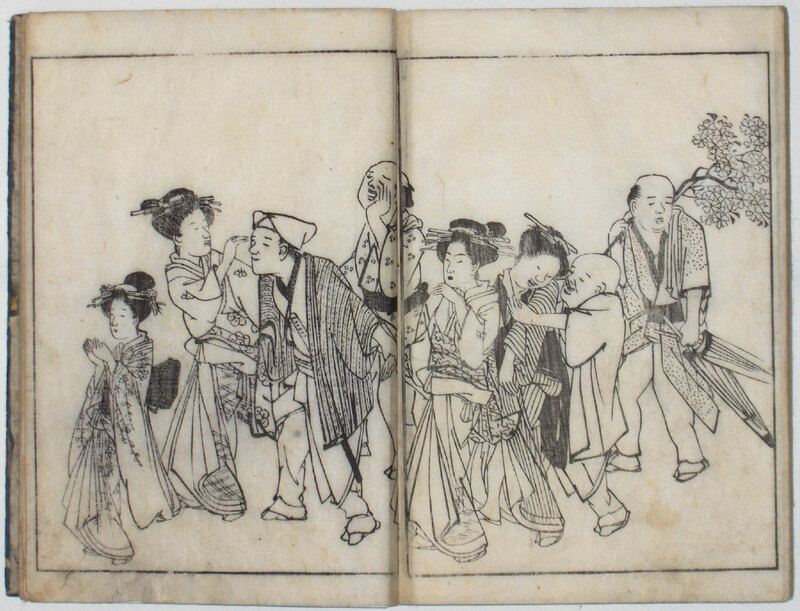 Yamato jimbutsu gafu, “An Album of Japanese Figure Drawings.” Three volumes, first series, bound as one, complete. 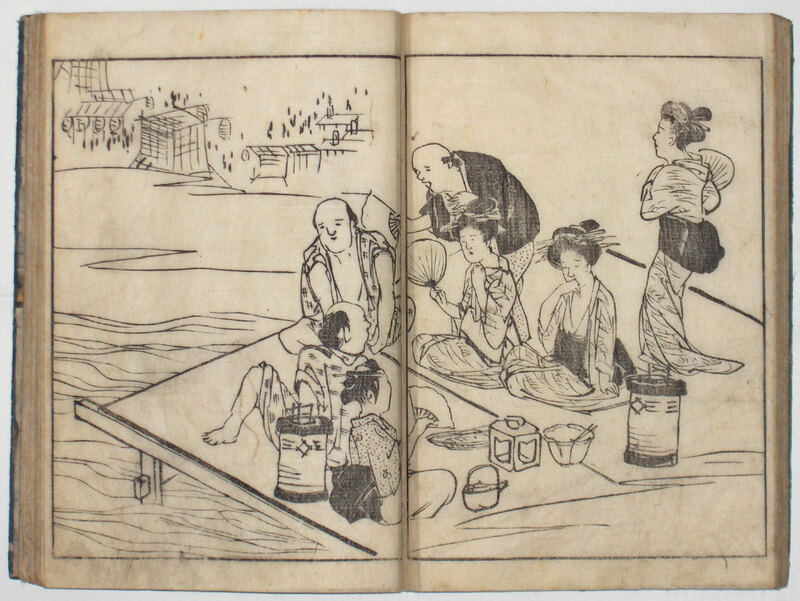 One of the great Maruyama/Shijo ehon showing 105pp of sumizuri-e scenes from daily life in Kyoto. 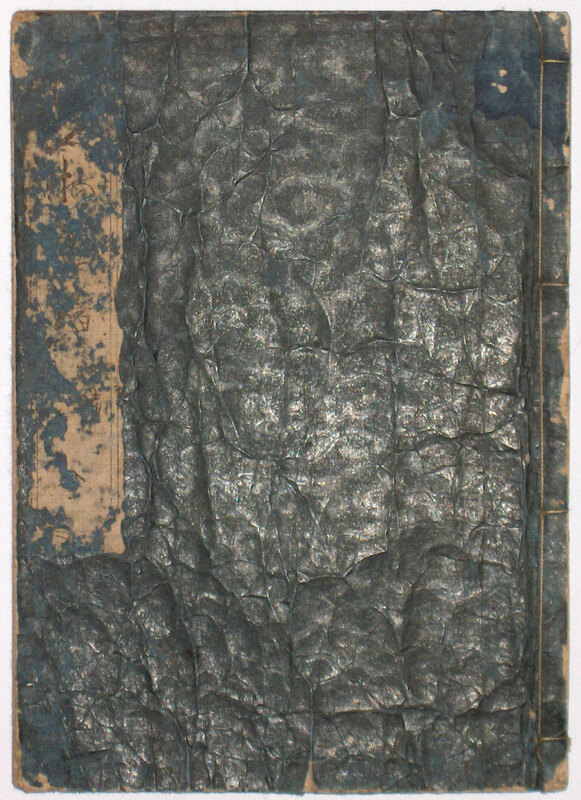 The compositions owe as much to what is left out as what is present with everyday activities imbued with insight and humour. 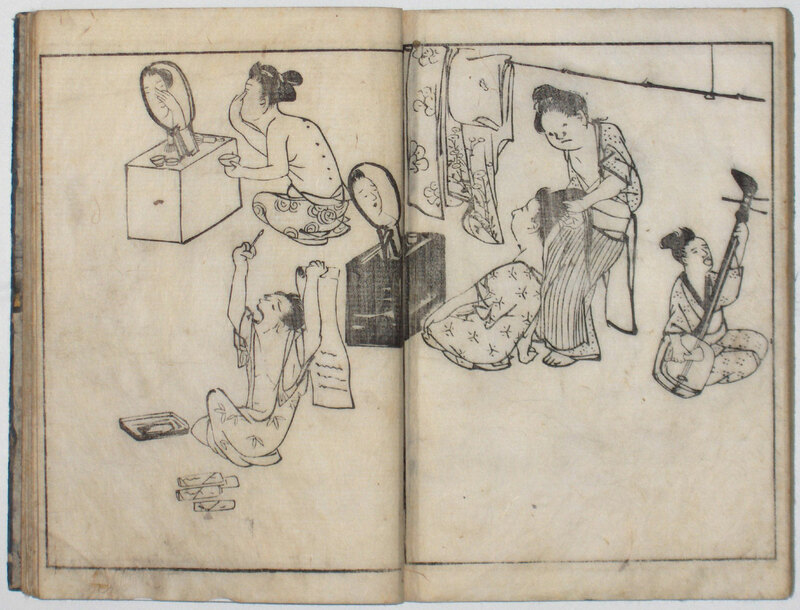 Without first preface ( as is often the case ); second preface dated Kansei 12 ( 1800 ). 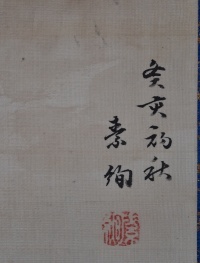 Colophon signed Yamaguchi Soken and dated Kansei 11 ( 1799 ). 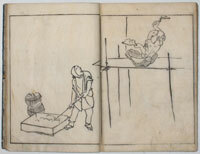 Each section starts with a single page showing plum blossom, pine and bamboo. 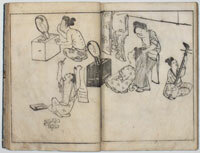 The book was reissued in 1802 and then reprinted together with the second series in 1804. 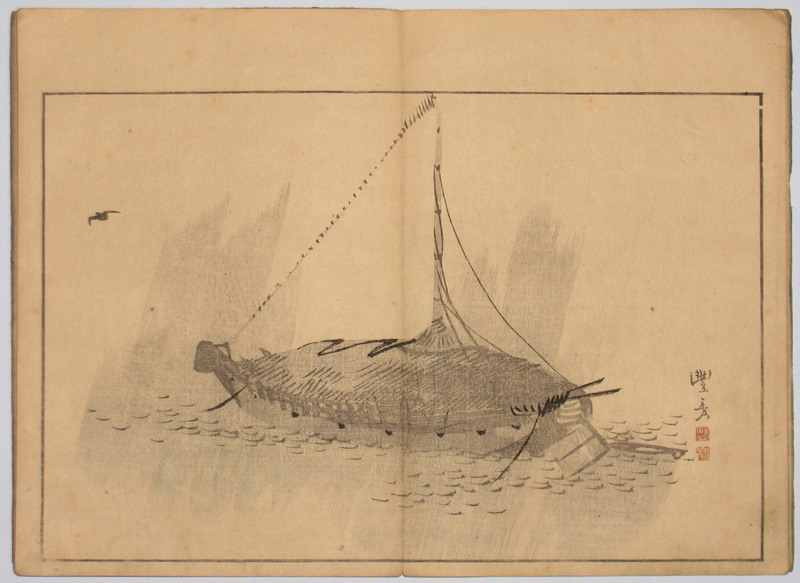 This is an early edition on thin paper. Opaque paper was used in the reprints and a title was added on each illustration. 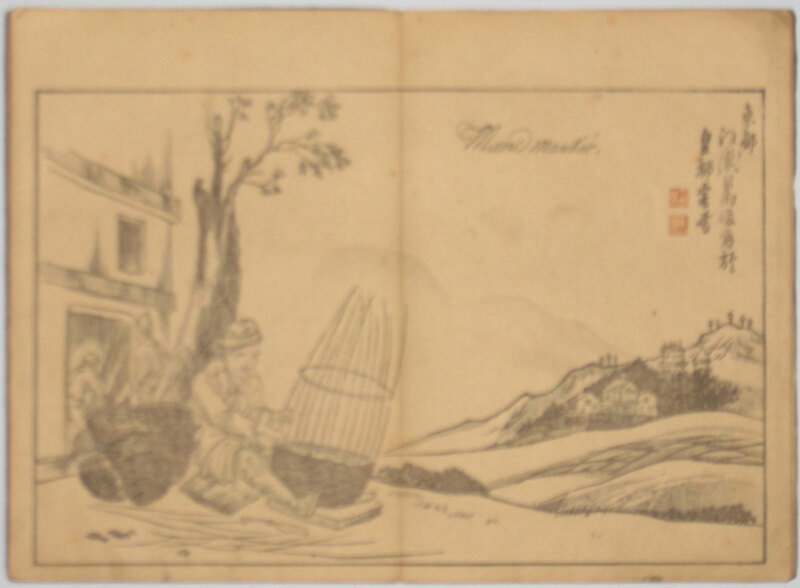 Original covers and title slip ( ? 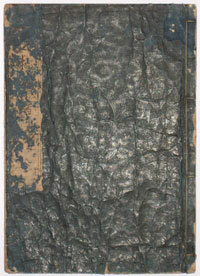 ), somewhat worn, giving it as one volume. Some minor marks and soil, otherwise good condition. 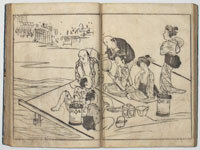 One volume complete Keijo Gaen, “An Album of Pictures by Kyoto Artists.” One of the finest of the Shijo anthologies. 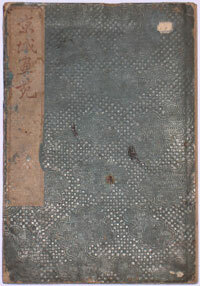 Published by Yoshida Shimbei, Bunka 9 ( 1812 ). 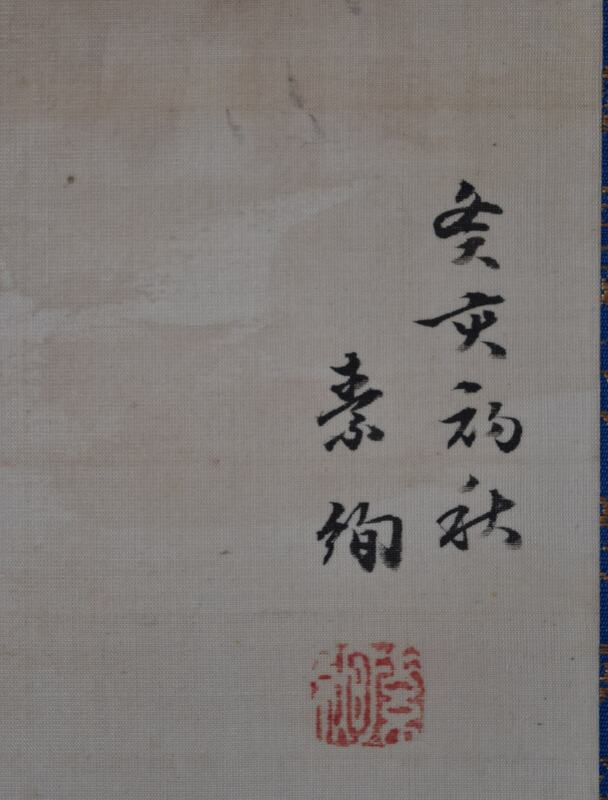 The colophon dated Bunka 11 ( 1814 ). 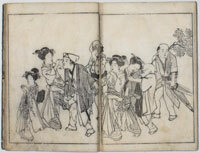 Twenty-six double-page illustrations by Goshun, Soken, Roshu, Hironari, Toyohiko, Shiba Kokan, Zaimei, Shoin, Toyo, Ozui, Keibun, Gito, Shodo, Hakuei, Gantei, Kokei, Nangaku, Gyokorin, Bummei, Kiho, Kosen, Minwa, Chikudo, Koshu, Geppo and Ozui ( in that order ). 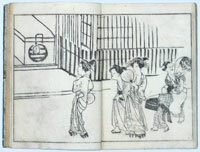 There are also copies known with twenty-five illustrations. Ex collection Hayashi ( small red seal ). Original blue covers with impressed pattern. Original brown title slip. 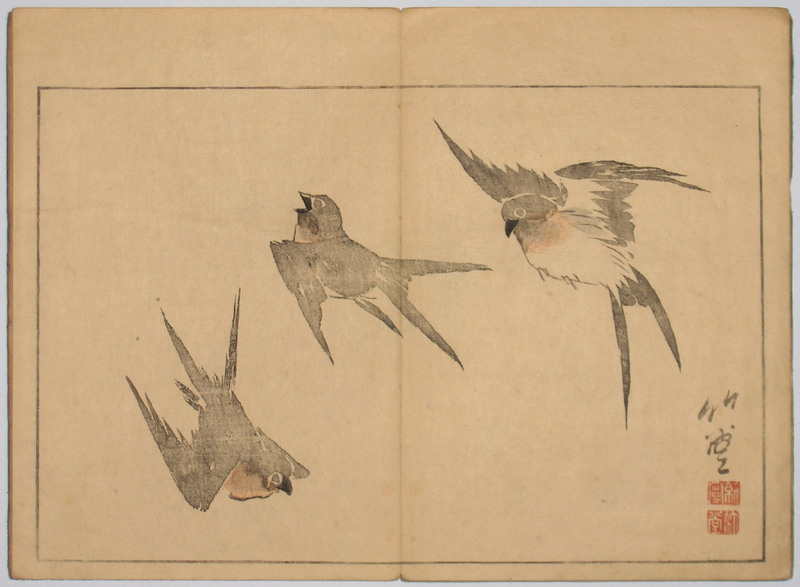 Minor marks and wormage, but generally good condition.